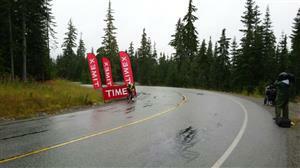 The first pro woman and and pro man on the bike to the Timex Bike Bonus at 35 km will earn an additional $1000. 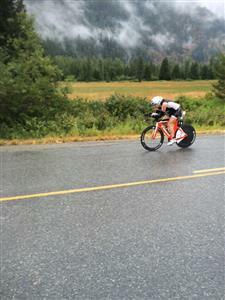 At 12 Km's Wassner has a 1:06 lead on Thibodeau who is riding in second. Next is Lyles +1:12, McQuaid +1:35, Madison +3:02 and Snow at +4:57. Buckingham is leading out the men at 28 km, with Bell +1:00 in second. Ambrose, and Symonds riding +2:30 down to the leader. Buckingham leading at 28 km's. Buckingham going through the Timex Bike Bonus first. At 35 km's Buckingham has a solid lead of 2:30 over Bell, while Ambrose is third, +3:32, McDonald +4:16, Sunberg +4:21, Zyemtsev +4:24, Symonds +4:48 and Brandon at 4:58. 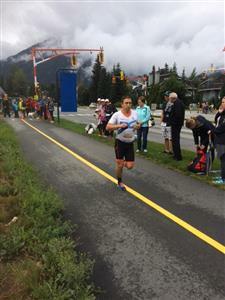 At 28 km's, Wassner continues to lead with McQuiad and Lyles just 43 and 45 seconds off the leaders pace. 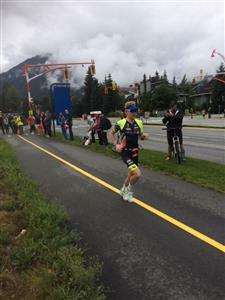 #IMCanada @laurelwassner has gone through the @TimexCanada Bike Bonus at 34 km's first and has earned herself the $1000 prime. 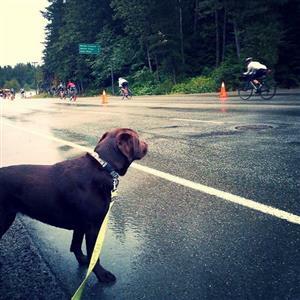 Our spotters are reporting the precipitation on the bike course varying from light showers to heavy rain depending on the where on the course they are at. 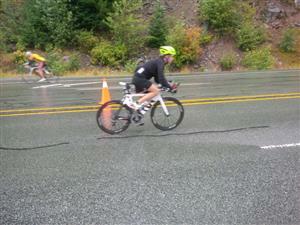 Buckingham off the front at 65 km's in the pouring rain. At 65 km's, Buckingham continues to lead with MacDonald, Zyemtsev and Sundberg riding together just over six minutes off the pace. No sign of Symonds, Bell or Ambrose... trying to find out if we missed them. We have a timing mat at 93 km's and we will find out then. 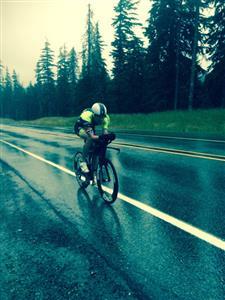 Correction: At 51 km's McQuaid has opened up a 3:50 lead on Madison and Wassner. Thibodeau, Flemming, Mack and Donavan are all +520 to +6:12 off of McQuaid's s pace up front. Our spotters saw no sign of Liz Lyles before they left for their location. At 75 km we have McQuaid with a commanding lead in the women's race. We believe that Donavan is the biggest mover in the standings and may have grabbed second. Splits coming in shortly. Our spotters are reporting that it continues to rain out on the course and there are spots where there is a lot of standing water on the road. 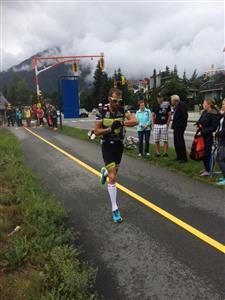 At 93 km's, Buckingham has a +6:56 lead on McDonald, +7:10 on Zyemtsev and looking strong in fourth is Garcia, +8:25. At 76 km's, McQuaid has a strong hold of the lead and has lead on a chase pack of five riding +4:25 to +4:45 of th Canadian's pace. The chase group contains Madison, Mack, Flemming, Wassner and Donavan. It appears that Thibodeau, who finished second here last year, has dropped out of the women's race. Zyemtsev at 100 km's in third. 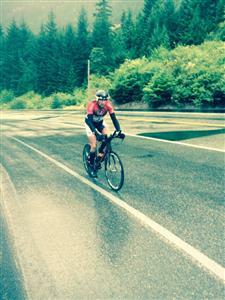 Buckingham at 117km's with huge lead. Wassner riding in chase pack almost five minutes off the leaders pace. 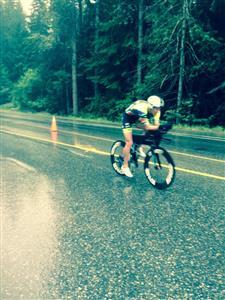 At 117 km Buckinham's lead is at +6:20 on McDonald and Zyemtsev. Garcia remains in fourth, +7:20 off the pace while Sundberg is riding fifth, +9:30. 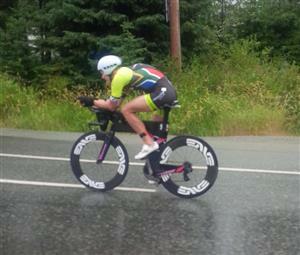 At 93 km's, McQuiaid's lead was +4:08 on Mack, +4:10 on Flemming, +4:51 on Madison and 5:04 on Donavan. Wassner has fallen off the pace and now is +7:54 down. At 107 km's McQuaid has a 4:10 advantage over Flemming, +5:00 on Madison, +5:15 Mack, +5:19 Donavan while Wassner has fallen back more, and is now riding over nine minutes of the leaders pace. It looks like Flemming is the only women to match McQuaid's pace between the last two time checks. 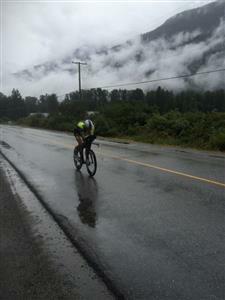 Buckingham continues to lead at 125 km's. McDonald is in second, +6:30 while Garcia is now riding in third, +7:30. Sundberg is riding in fourth, +9:00 and Daerr riding in fifth, +11:45. At 147 km's Buckingham has a solid 6:43 lead on McDonald, while Garcia is in third, +7:10, Daerr in fourth, +8:30 and a fading Zyemtsev is now in fifth, +8:32. 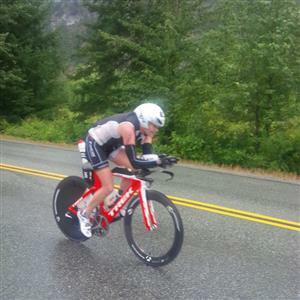 Mel McQuaid looking strong at 135 km's into the bike in her first Ironman of her career. At 135 km's, McQuaid continues to lead with a chase group containing Flemming +4:27, Donavan +5:05, Mack +5:07, and Madison +5:08.
Notable DNF's are Jeff Symonds, Paul Ambrose, Luke Bell, and Karen Thibodeau that we know of. At 147 km's in the women's race, McQuaid has put in a few seconds on the field and now has a +4:40 lead on Flemming, +5:17 on Donavan, +5:17 on Madison and +5:22 on Mack. Buckingham coming into the village with good size lead. Second year pro Kyle Buckingham has just dismounted his bike and scampered into T2 with a clear lead. Buckingham heads out on the run. We have a tight race between second and fifth. McDonald is second off the bike, +5:13 off the leaders pace. Garcia is next at +6:01, followed by Zyemtsev at +6:15 and Daerr at +6:35. Chris McDonald starts his run in second. Derek Garcia a former resident of Coeur d'Alene starts the run in third.